If you are like me and have a LEGO fan on the Holiday shopping list, you know how HARD it is to find GREAT DEALS! Well, I have some GREAT news for you. Walmart has released 19 different Lego Sets for an awesome promo. 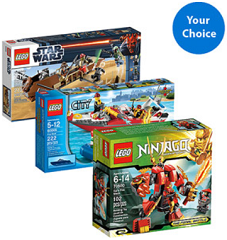 You can pick any 2 Lego Sets from this selection for ONLY $29. Pick 2 Lego Sets and SCORE! Remember, that you'll get FREE Shipping with any $35 purchase or even FREE Ship to store.